This functions permanently adds the symbol symbolName with the value symbolValue. These symbols are searched before any libraries. Definition at line 213 of file DynamicLibrary.cpp. This function permanently loads the dynamic library at the given path. It is safe to call this function multiple times for the same library. Definition at line 205 of file DynamicLibrary.cpp. 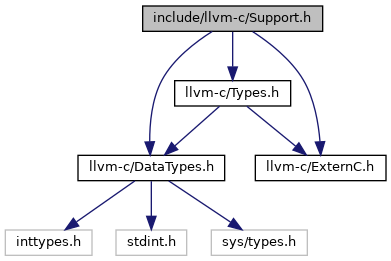 This function parses the given arguments using the LLVM command line parser. Note that the only stable thing about this function is its signature; you cannot rely on any particular set of command line arguments being interpreted the same way across LLVM versions. Definition at line 2372 of file CommandLine.cpp. This function will search through all previously loaded dynamic libraries for the symbol symbolName. If it is found, the address of that symbol is returned. If not, null is returned. Definition at line 209 of file DynamicLibrary.cpp.